This super fruit has the power to drive large scale rainforest conservation while improving the livelihoods of indigenous Amazonian people. The Amazon rainforest is home to myriad plant species with exceptionally high medicinal and nutritional value. 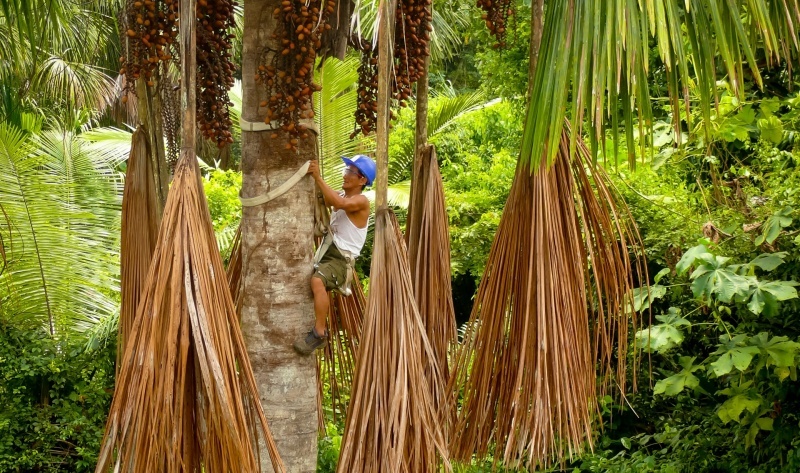 Among them is buriti, the fruit of the moriche palm found throughout the Peruvian Amazon where we are working. High in vitamins A and C, buriti contains five times more beta-carotene than carrots. It is a powerful natural antioxidant that is also proven to help lower cholesterol, mitigate menopause symptoms and improve skin elasticity. This species thrives in the swamps of the Peruvian Amazon, covering 7.5 million acres in the western Loreto region of Peru, which is also home to the highest density of indigenous people in the country. For centuries, buriti has been consumed locally for its powerful health benefits, but it has yet to be marketed outside of the region. By securing a sustainable source of income for the indigenous people of Loreto, this super fruit can become a powerful tool for conservation – catalyzing the protection of millions of acres to secure this natural resource. Nature & Culture’s buriti project will help indigenous communities benefit economically while protecting areas of this Amazonian palm. Now, Nature & Culture is developing a major program alongside indigenous communities and the regional government of Loreto to develop a sustainable market for buriti. With thousands of local producers to ensure the supply chain, we are working with market research firms to explore opportunities for selling this super fruit in the U.S. in oil, flake and powder form. With proven experience in aligning conservation with sustainable development, strong in-country alliances, and an on-the-ground presence through six offices and 50 field staff in the Peruvian Amazon, we are well positioned to bring this new market to scale.